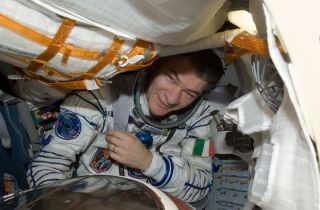 European Space Agency astronaut Paolo Nespoli, Expedition 27 flight engineer, attired in a Russian Sokol launch and entry suit, is pictured in the Soyuz TMA-20 spacecraft currently docked to the Rassvet Mini-Research Module 1 (MRM1) of the International Space Station. The mother of Italian astronaut Paolo Nespoli, who is currently living on the International Space Station, has died in her hometown just outside Milan. Nespoli's mother Maria Motta, 78, died late Monday (May 2) in the town of Verano Brianza and family members have been in contact with Nespoli, according to the Associated Press. Nespoli is a veteran astronaut for the European Space Agency. His wife and daughter were among the family members with his mother when she died of an illness. Nespoli has been living on the space station 220 miles (354 km) above Earth since December. He is one of six people on the station and is due to return to Earth on May 23, when his six-month mission ends. Two Americans and three Russians make up the rest of the crew. In addition to Nespoli, Motta is survived by two other children, the Associated Press reported. Nespoli's father died in 2007, shortly before his first spaceflight on NASA's shuttle Discovery, it stated. Nespoli is one of only a few astronauts to be stuck in space during the death of a close family member or other tragedy. In 2007, NASA astronaut Dan Tani was living aboard the International Space Station when his 90-year-old mother Rose was killed when a train struck her car. At the time, NASA flight surgeons and other support personnel were available to Tani should he need their assistance. Mission Control also kept Tani's schedule flexible to meet his needs, and his crewmates were also available for support as needed. Earlier this year, NASA astronaut Scott Kelly was living on the space station when his sister-in-law Gabrielle Giffords, an Arizona congresswoman, was shot in the head in an attack. Giffords survived the attack and is recovering. She hopes to watch the launch of her husband, NASA astronaut Mark Kelly (the identical twin brother of Scott) this month aboard the space shuttle Endeavour. While ESA officials have not yet made a statement regarding Nespoli's mother, the same type of support from ESA's mission operations center and NASA's space station Mission Control room is anticipated. Nespoli, like other crewmembers, also has regular access to an Internet protocol phone to call his family, as well as email and other Internet communication tools. Nespoli is expecting to welcome another Italian astronaut, ESA spaceflyer Roberto Vittori, on the space station next week. Vittori is part of the six-man crew of NASA's final flight of shuttle Endeavour, though the mission has been delayed to no earlier than May 10 due to a technical malfunction. When Vittori and Nespoli meet it will be the first time two Italian astronauts have been together in space at the same time. Pope Benedict XVI may call to the space station to speak with the two Italian spaceflyers and mark the occasion.